A little elegance and sweet fragrance for St. Patrick’s Day. Make a sweet, scented paper doily sachet decorated with green ribbons and shamrocks for St. Patrick’s Day. Glue together two paper doilies leaving an opening at the top of your doily. Allow the glue to dry. Tear up a little white tissue paper and spray a little fragrance on the tissue. Once your glue on the doilies is dry, push the scented tissue paper inside the doily and glue the doily opening closed. Allow the glue to dry before handling again. 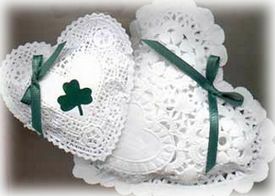 Tie a small green ribbon bow and glue in place (see photo) and attach either a shamrock sticker or cut out to the heart doily. You can also add a written greeting to the centre of the heart with a green pen or marker. If you decide to add a greeting, be sure to make this the first thing you do, as it will be difficult to write on the doily once it is assembled. If you would like use these as hangers, add a piece of green ribbon to the top centre of the heart. Do this before you glue the top two doilies together, inserting the ribbon on the inside of the two hearts and securing with a little glue.